Jan. 21 -- As the scandal that broke Friday around the UN Development Program's audits of its North Korea program is slated to be considered by UNDP's Executive Board this week, UNDP's Associate Ad Director Melkert has reportedly decreed that UNDP's Office for Audit and Performance Review should "have no Americans," particularly to replace the head auditor who is leaving. Very recently, OAPR director Jessie Rose Mabutas decided to leave UNDP in mid-February. The deputy auditor spot below her is also being filled. Unless and until the UNDP Executive Board decides differently at its meetings this week, those installed in these audit position will be chosen by UNDP's Administrator, Kemal Dervis. As with UNDP's refusal to provide copies of internal audits even to member states on its Executive Board, this UNDP policy differs from that of the UN Secretariat. The head of the audit unit for the Secretariat, the Office of Internal Oversight Services, is subject to review and confirmation by the 192 member states of the UN General Assembly. Some are predicting rare push-back this week from the UNDP Executive Board, including not only a move to ensure that Dervis not select Ms. Mabutas' replacement -- reportedly, Dervis' desperate search for a successor is Francophile focused -- but also perhaps one to hold Ms. Mabutas and UNDP Asia Pacific director Hafiz Pasha, among others, accountable for the non-action on KPMG's 1999, 2001 and 2004 audits of UNDP's North Korea programs. As reported, UNDP paid hard currency directly to the Kim Jong Il regime. On January 19, Ad Melkert claimed that this did not violate any UNDP rules. This is repeated on UNDP's web site, click here to view, with its carefully edited version of Melkert's Jan. 19 press conference. But UNDP's operations in North Korea, as in the other countries in which it operates, is governed by a Standard Basic Assistance Agreement or SBAA. The UNDP North Korea SBAA provides that payments must be in local currency: "all payments will be made in local currency on the basis of monthly invoices submitted to the Resident Representative." The SBAA also provided that the government would not charge for rent or electricity -- but UNDP has been paying hard currency to the government for both, in violation of the SBAA. Just as UNDP has withheld from Inner City Press the SBAA for Liberia, UNDP has withheld from all requesters the above-quoted North Korea SBAA. 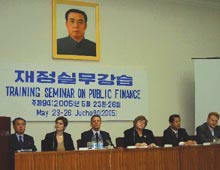 Focus has also shifted to the source of the hard currency which UNDP has paid to the North Korean government. Much has been so-called "pass through" funding, from South Korea. Some question whether Ban Ki-moon, after serving as South Korea's foreign minister, will have an interest in full disclosure of the findings of a detailed audit of the source of the hard currency UNDP handed to the Democratic People's Republic of Korea. Inner City Press has previously requested, received and reported on the "discretionary" budget of UNDP Administrator Kemal Dervis. In this budget in 2006, along with payments for a book about UNDP that does not mention North Korea, there was a $67,000 expenditure described as "Funding for Special Audits," and described in full as "additional resources were made available to fund an urgent, unscheduled audit to investigate concerns that had arisen in one country office" -- a country left unidentified. That is may have been North Korea is now in question. While such an audit within the UN Secretariat would have to be disclosed to any of the 192 member states upon their request, at UNDP things are quite different. Only a summary would be provided, and only to the countries on UNDP's Executive Board. While some have said this inconsistency, of UNDP lagging behind the UN Secretariat in terms of transparency, will be fixed soon, Mr. Dervis on December 21 said this might not happen, due to "privacy" concerns. Dervis has also stated that the audits must be withheld because they are "management tools." Management, however, did not address or fix the issues raised in the audits about North Korea, just as management has resisted evaluation of, and inquires about, even its Millennium Development Goals operation, now in the embattled Poverty Group. On Jan. 19, responding to the UNDP scandals, Secretary-General Ban Ki-moon called for an "urgent, system wide and external inquiry into all activities done around the globe" by UN funds, programs and agencies. His spokeswoman has said that the results will be made public. UNDP will be asked to name the country which in 2006 required an "urgent, unscheduled audit to investigate concerns that had arisen" there. Since the North Korea issues which UNDP says have been taken so seriously were not even mentioned in the most recent publicly-available audit of UNDP, Inner City Press has asked Ad Melkert and UNDP Communications Director David Morrison to now disclose any other problem countries -- or "tough cookies," as Ad Melkert put it during his January 19 press conference -- that are not identified in UNDP's public audit. David Morrison, who ran UNDP's January 19 press conference, was in North Korea for UNDP as far back as 1988. According to NetAid.org, "Mr. Morrison began his career with the United Nations Development Programme (UNDP) in North Korea in 1988, becoming one of the few Westerners ever to have lived in that country." Click here for more. 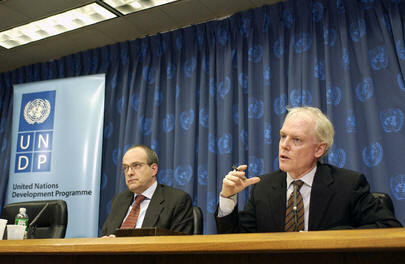 During the January 19 press conference, Ad Melkert referred reporters to UNICEF and to the World Food Program. He did not mention, however, that other UN agencies in North Korea, as in many other countries, operate under UNDP's agreements and guidance, a power currently proposed to further expand under "coherence" plans announced under Kofi Annan and his deputy Mark Malloch Brown. And even so, Inner City Press is informed that the World Food Program does not pay in hard currency in North Korea, it pays in local currency and does not pay rent to the North Korean government, as it uses space in the Bulgarian embassy. There are, for sure, other UN agencies accepting seconded staff in North Korea. Inner City Press has learned that a November 2006 KPMG audit of the North Korean operations of the UN Population Fund, UNFPA, made similar findings. UNFPA accepts staff seconded by the North Korean government, making "competitive selection not advisable." UNFPA in North Korea raised this issue to the regional director for Asia and the Pacific, but UNFPA never formally responded, to provide an exemption or not. Inner City Press is finalizing a companion piece on UNFPA, including its practices with respect to currency, and is submitting questions to other funds, programs and agencies. UNFPA sources tell Inner City Press that this non-response by headquarters to serious questions from the field is common, as a way to keep senior management's hands clean. The Asia and Pacific regional director for UNDP, Hafiz Pasha, is looked at as the first in a chain of accountability for the UNDP North Korea scandal. It was his region. But some are saying that the accountability must move up the chain, as early as the Executive Board meetings this week. Developing. UN, January 20, 5:55 am -- As the UN Development Program tries to deflect the scandal and investigation now surrounding its failure to release damning internal audits of its programs in North Korea, including by quickly offering "broadcast quality" snippets of Friday's press conference, other issues emerge from the recent correspondence between UNDP and the U.S. Mission. Inner City Press has and has had in its possession the chain of letters, extensively quoted from below. Among other things, it is clear that Kemal Dervis tries to refer even major funders to his do-it-all Number Two, Ad Melkert, or even simply to his chief of staff, Tegegnwork Gettu. As regards the seeming commitment to stop paying in hard currency by March 1, 2007, in fact there is a loophole, under which such payment could continue if certified by the Administrator. Just as questions have grown about UNDP's OAPR, this auditing unit's director, Jessie Mabutas, has decided to leave. While UNDP has refused to confirm Inner City Press' earlier report about Ms. Mabutas' decision to leave to a job at IFAD, staff have confirmed she is leaving at latest in March. UNDP's press conference on Friday, announced for the first time to the UN press corps less than 20 minutes before it began, now appears in a different light. During the 39 minute press conference, a half-dozen journalists asked questions highly skeptical of UNDP's answers and operations. Click here for full 39 minute video from UN Television, and compare it and even the UN's News Service write-up to the video now offered near the bottom of this UNDP web page. UNDP went and prepared carefully edited excerpts, excluding questions that UNDP didn't like, and tacking on a mock interview in which Melkert says that the purpose of the forthcoming audit is to prove that UNDP is right. As with the book for which UNDP used $737,000 in funds meant for the poor, UNDP would be sure to try to characterize such a pre-determined audit as "an independent work." One irony is that UNDP has asked for a correction of Inner City Press' review of the book as bought and paid for by UNDP, and has more recently request a correction of how Inner City Press presented excepts from a press conference by the UN's then-spokesman Stephane Dujarric, even where Inner City Press linked to the full transcript. UNDP's requests are now even more ludicrous. A source calls it "vintage UNDP, expensive damage control on steroid, as if they'll now show how UNDP would have defended against, and prevail over, the Oil for Food scandal." We'll see. In the spirit of excerpt, here are some from the exchange of letters between U.S. Mission and UNDP that preceded and led up to the widely reported January 16 letter from Ambassador Wallace to Melkert, with some analytic notes, labeled as such, in brackets. Amb. Wallace to Dervis, December 14, 2006: "While your office suggested that we meet with Associate Administrator Ad Melkert, my government views this subject as one of great and urgent importance and requests the opportunity to discuss the matter directly with you." Amb. Wallace to Dervis, December 22, 2006: "Thank you for the follow-up meeting December 22 to discuss United States concern with the UNDP program in North Korea... As we agreed at the meeting today, we are expecting to receive from you [audits and] confirmation that you will formally take action to retain and preserve any and all documents and materials including, but not limited to, electronic media related in any way to UNDP's program in North Korea during the past seven years." Amb. Wallace to Dervis, January 4, 2007: "Thank you for returning my call and it was good speaking with you yesterday evening. In our call you advised me that UNDP -- after your consultations with other UN Programs -- would not provide the United States Government (USG) with copies of Internal Audit9s) of UNDP programs in the DPRK. You did indicate that you and your UNDP colleagues (specifically Ad Melkert) were in the midst of reviewing and compiling relevant UNDP financial and program information for the DPRK...UNDP's refusal to provide copies of its internal audit(s) of the UNDP program in DPRK is non sustainable... UNDP has been and is continuing (per your representation, at least until March) to transfer hard currency directly to the Kim regime." Dervis to Amb. Wallace, January 5, 2007: "I will convene a special meeting of the Executive Committee agencies to discuss the issue of direct access to internal audit reports of DPRK and others more generally." Melkert to Amb. Wallace, January 5, 2007 (first of two letters on that date) -- "As stated by the Administrator in our meeting on December 22, 2006 we have informed the government earlier that salaries of seconded national staff, local purchases of goods and services, local travel allowances and other similar expenses will in future be paid in convertible won. This can only be obtained by converting hard currency in the state bank of DPRK." Amb. Wallace to Dervis, January 8, 2007: "Is the permission or authorization from the Executive Committee required in order for UNDP to share the internal audits of DPRK with Executive Board members? If so, please indicate what authority imposes this requirement." Dervis to Amb. Wallace, January 9, 2007: "We will provide you the opportunity of an on-site examination of the documents. UNDP is, on an exceptional basis, adopting this approach on a voluntary basis and with the full preservation of privileges and immunities." Also on January 9, 2007, U.S. Amb. Richard T. Miller formally notified Dervis that the U.S. was requesting discussion of the DPRK program before the Board. At an informal consultation of the Board attended and reported on by Inner City Press, the UNDP chairperson of the meeting said that program would only actually be discussed if five country made writing requests, which hadn't happened. That meeting was after Amb. Miller's letter, so apparently the five-request threshold had not yet been reached. Subsequently it was, including with the request of Serbia. Melkert to Wallace, January 12, 2007: "We have instructed the DPRK Country Office that all payments in hard currency to government, national partners, local staff and local vendors should end at the latest by 1 March 2007. In case the Country Office will need an exception, prior approval from Headquarters will be required... within the context of the 'single audit' principle, I am unable to accede to your request for various documents, such as memoranda and other forms of communications." In this letter, Ad Melkert also makes a point of naming UNICEF as the funder of a DPRK official's travel. How UNDP's attempt to deflect criticism by referring inquirers, including the reporters at Friday's press conference, to other UN agencies will play out remains to be seen. Reuters reports that "UNICEF said it had not decided at this point to change the way it pays for its programs in North Korea. 'We do pay national staff through the host government in euros. There has been no decision at this point to change that,' said Geoffrey Keele, a UNICEF spokesman." The Washington Post, citing an anonymous "senior UN official," emphasizes to readers that UNICEF and the World Food Program are headed by Americans, while UNDP has not been. If as news (and source) analysis we're right, this particular "senior UN official" is praised in "UNDP: A Better Way?" and now intends to take a leave of absence from, but retain his rights and privileges in, the UN. There are other agencies, on which we will report. Developing. While the Journal describes how UNDP would not provide copies of internal audits to member states, it is additionally significant that in UNDP's publicly-available audit, despite mentions of fraud in for example the UNDP-Russia country office, there is no mention of the North Korea issues that UNDP now claims it was taking so seriously. Friday Inner City Press asked Mr. Melkert to now publicly identify any other issues of concern to him and Kemal Dervis that are not disclosed in the last public audit. Video here, from Minute 31:05. Mr. Melkert claimed that to now make such a disclosure would be "too much at random." Disclosure would certainly be out of character for UNDP, at least for now. Mr. Melkert met Friday morning with new UN Secretary-General Ban Ki-moon -- at Mr. Ban's request, his spokeswoman told Inner City Press -- and then quickly scheduled an 11:30 press conference. At the podium a decision was made to pull the curtain over the UN's logo, leaving only a UNDP banner next to Mr. Melkert as he fielded questions. Logistics sources ascribe the curtain-pulling to a decision by the Secretariat to distance itself from UNDP. But as Inner City Press pointed out to the spokeswoman, most readers and most headline-writers don't make any distinction. This is a United Nations scandal, and must be addressed by the Secretariat and member states. An easy starting place, a bare minimum, should be getting UNDP's policy on the disclosure of audit in line at least with that of the UN Secretariat, which gives copies of internal audits to any member state which requests them. As this North Korea example illustrates, UNDP refuses to provide copies of its internal audits to member states, or the press or public. Having been denied access to UNDP audits, Inner City Press asked Ad Melkert about this discrepancy on December 15. At that time, Mr. Melkert committed to greater transparency, specifically with regard to this withholding of audits. Video here. Kemal Dervis, however, ostensibly running UNDP, on December 21 answered the same question by saying that audits would have to continue to be withheld, in the name of privacy. As one journalist -- not from Inner City Press -- joked on Friday, Kim Jong Il's privacy seems to have been important to UNDP, indeed. On Friday, Ad Melkert thanked Inner City Press for "referring to our previous exchange." Melkert said, "I promised more transparency, and that is what we have delivered." Video here, from Minute 10:23. He went on to say that rather than having taken steps since December 15 to change UNDP's policy, he holding discussion on the issue and "that will take some time." What exactly has been "delivered," then, in terms of transparency as well as in terms of concrete assistance to the poor in North Korea remains unclear. Responding to the scandal at UNDP, Ban Ki-moon has called for an "urgent, system wide and external inquiry into all activities done around the globe by the UN funds and programs." On Friday, Inner City Press asked him spokeswoman if Kemal Dervis was asked to submit a letter of resignation, as even Assistant Secretaries-General have. The spokeswoman said that she did not know. Video here, from Minute 8:35. Inner City Press has asked UNDP for a list of those in the agency who have submitted letters of resignation, but no response has been provided. As one reporter pointed out Friday, when performance is bad enough and brings disrepute on the UN system, a letter offering to resign is not always needed. As captured by a detailed account on the UN's own News Service, for now the defense appears to be that Mr. Dervis hasn't been there long. UNDP sources says after 17 months, it would be more accurate to say that Mr. Dervis hasn't been there much. Ad Melkert: "You ain't seen nothing yet." Ad Melkert was asked to explain his "you ain't seen nothing yet" response to Inner City Press' request for the audits for UNDP in Russia, Honduras and Afghanistan. (Technically, Mr. Melkert's statement is accurate: Inner City Press hasn't seen anything yet, not a single page of these audits.) Mr. Melkert's response might seem to bode well. He explained, "In terms of transparency. Mr. Lee [Inner City Press' UN correspondent] is particularly interested in knowing what is going on at UNDP. And right he is." Video here, at Minute 32:43. Taking that statement at face value, one would now expect to actually see long-ago requested documents and audits, and to get direct answers to questions such as whether UNDP allows donors (for example, Italy) to dictate which staff to which with their money, and where to deploy them (for example, Baidoa in Somalia). Inner City Press has asked that question to UNDP, and has been sent extraneous documents, with no direct yes or no answer to a simple factual question. The same holds true for UNDP's policy about awarding consulting contacts to companies staffed or advised by recent UNDP officials. Inner City Press asked for this policy and days have gone by. We will have more on all this soon. Again, because a number of Inner City Press' UNDP sources go out of their way to express commitment to serving the poor, and while it should be unnecessary, Inner City Press is compelled to conclude this installment in a necessarily-ongoing series by saluting the stated goals of UNDP and many of its staff. Keep those cards, letters and emails coming, and phone calls too, we apologize for any phone tag, but please continue trying, and keep the information flowing.